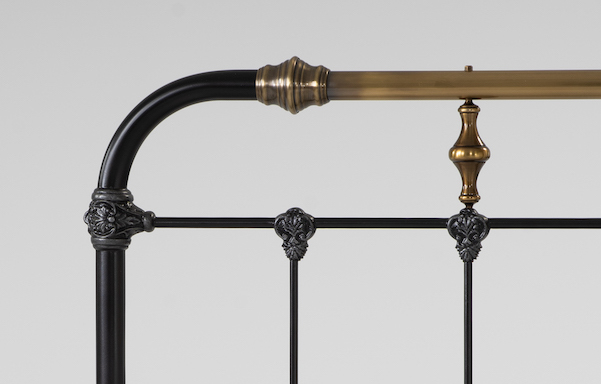 This original "gaslight" style is one of our oldest iron & brass bed designs. Decorative accents are cast by hand directly onto the iron framework. Turned spindles are solid brass castings. An authentic, classic design. Height under frame from floor 11"
Review: "I had been looking at beds for awhile and had my eye on this one for sometime. The style and quality of the bed is exactly what I was looking for; I am happy I finally made the purchase. Now I wish I had another bedroom to furnish." Review: "This bed is fabulous! I've been looking for something "special" for a very long time and finally found it. The bed came wrapped well and had easy instructions. My husband put it together as a surprise for me while I went to the grocery store, and he had no trouble. Everytime he walks into our bedroom he tells me how beautiful our new bed is. And I agree!" Review: "I saw an add in a magazine about 20 years ago and fell in love with the Campaign bed. I didn\'t think about it for many years until I saw the add again. We were finally able to purchase a King size about 8 years ago but decided on the Boston Bed. It still looks as good as the day we put it together. It has even traveled across country in a moving van. I have had many compliments on the bed. It\'s very solid. My experience with Charles Rogers has been excellent. A few years ago I purchased a Newfield Queen size bed and I\'m about to purchase the Campaign bed that I have had my signts on for 20 years in a few minutes. I have seen other iron and brass beds in furniture stores and they are not as solid and heavy as these beds.. These will last my lifetime." Review: "I love this bed. It is sturdy, beautiful and not too hard to put together. If you are looking for an iron bed, this one is great." Review: "The Boston Bed is top notch; beautiful and very solidly constructed. It's a classic style, and the mixed metals will suit a variety of decors and accessories. My frame was shipped prompt and the free inside delivery is a nice customer service touch. I'm extremely happy with this purchase, and Craig J. in Sales Support was a pleasure to work with." Review: "I have had my eye on this bed for 15 years. The house that we lived in at that time did not support the grandeur and height of this bed. The day we bought our 'new' house in Florida was the day that we ordered this 'dream' bed. It is spectacular! The quality is outstanding as was the ease of assembly. The service that we received from 'Niles' was extraordinary as well. We have since ordered a second iron bed from CPR for our guest room. I can't wait for it to arrive. Thanks to all of you at Charles P Rogers...your service is outstanding!" Review: "LOVE THIS BED! ABSOLUTELY GORGEOUS AND IMPROVES MATTRESS SUPPORT." Review: "This is a beautiful bed, solid and so beatifully made. I was particularly impressed with how it was packed so it arrived unscathed in the shipping process and the quality is exceptional. 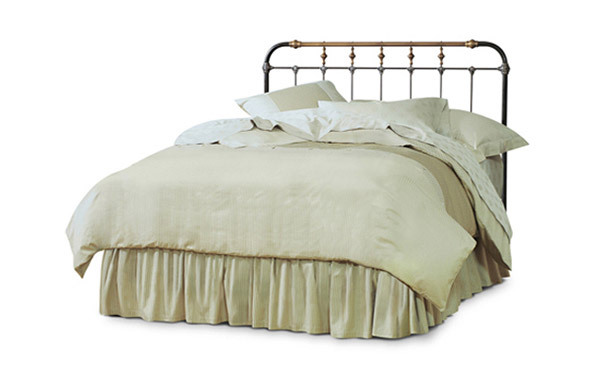 I looked a long time for a brass/iron bed and this is the best I've ever seen." Review: "I have now had this bed for about 5 years. I found it online after searching for about two years for a bed that reminded me of our farm when I was a kid. Serendipitously, a business trip took me to New York (I live in the midwest) so I could see the bed before purchasing it. It is beautiful and extremely well-made. It arrived packaged extremely well with assembly instructions which were easy to follow. Needless to say, it looks great in my house. In addition, it has held up fine over the past five years. It is as sturdy as the day I finished assembly. With this level of quality, I hope my great grandchildren will be enjoying the bed as much as I do. I have never regretted the purchase. It is time to re-decorate another bedroom in my house. Based on my experience with Charles P. Rogers, I will not have to shop at any other stores or sites." Review: "I found almost the exact same bed on another website. The only difference was the decorative pieces that are on the footboard where the vertical bars meet the horizontal bar that goes across the bottom. These were not on the bed from the other site. The other bed, by the time I paid for shipping and a delivery up charge, would have cost me right at $2,600, plus it was missing the decorative pieces I mentioned above. For what I saved in buying this bed, I was able to buy all new bedding, including a down comforter, quilt and decorative pillows, for what I would have paid for the other bed. I am so happy with this bed. It is beautiful and very, very sturdy. I was afraid it would be on the "flimsy" side but it is just the opposite. It came packaged extremely well. There was not a scratch on it anywhere. The finish on it is pristine. They did include a bottle of touch up paint. As for the assembly, two of us put it together but it was more for balancing the pieces as they were put together. It was very, very easy to assemble. I could have put it together myself but having the second person there to help hold it while tightening the bolts helped but was not necessary. The pictures of this bed on the website do not do it justice. It is just a beautiful, well made bed." Review: "We researched for some time before we purchased this bed from Charles P. Rogers. We purchased the Boston Bed in a king size. This bed is absolutely BEAUTIFUL!!! The quality and craftsmanship are superb! The bed was not difficult to assemble and is very solid. It is a simply a classic!!! Would highly recommend!" Review: "the bed is everything I hoped it would be. Always just a little leary of buying things from a picture when you can't touch it and see it first hand. Figured they must be doing something right to have been in business as long as they have been in these days." Review: "My husband and I received our new Boston Bed a couple of weeks ago, and we're thrilled with it. Not only is it beautiful, but it was well-packaged for the shipping and is extremely well-made and sturdy. It was easy for the two of us to assemble and set up also. I just can't think of enough glowing words to describe how much we love this new gorgeous piece of furniture. If you have any kind of hesitation about placing an online order for something like this - don't worry. Everything went beautifully, and I can't imagine anyone being unhappy with this." Review: "This is the second iron bed I have ordered from Charles P. Rogers. Both times I have been extremely impressed. These are not the cheap imitation hollow "iron beds" sold in most retail stores. They are heavy, sturdy construction and even more beautiful than depicted in the photos. The Boston Bed style is my favorite thus far. Future purchases will definitely be from this company!" Review: "We love our new bed! I was a little worried about ordering this sight unseen. The product had so many great reviews I went ahead and took the plunge! It is beautiful and well made! Very substantial and looks so nice in my room! Not hard to assemble either." Review: "We ordered the bed frame over the phone and relied on the salesman's overview regarding quality and actual look versus website pic's. He was not misleading, as when we received the the bed frame we were in awe. This model is high quality, has intricate detail and is genuinely gorgeous. Overall, it was a great buying experience with a quality product, highly recommend."